Glossary of British Words: What is an Allotment? If someone invites you to share a beer "down the allotment", do accept. You'll see a kind of British urban gardening that has a long history but could well disappear in the next few decades. Fans of Eastenders, old Ealing Comedies or other British dramas of ordinary working people in the 20th century, have probably seen some old codger tending a tiny vegetable patch or having a nip of home brew in a garden shed somehow removed from his home or his normal environs. "Where's Arthur? I haven't seen him all day." "Oh, he's down working on the allotment." In everyday English, an allotment just means a measured out share of something. But in British English, the word allotment has a specific meaning with historic resonance. Allotments are small pieces of land that are rented to local people so that they can grow their own fruit, vegetables, and flowers. The history of allotments goes back to Anglo-Saxon times and they are still measured in the Anglo-Saxon measure of rods or poles. An allotment of 10 rods or poles is about 250 square meters or 300 square yards. The land may be owned by the local council, by church authorities or allotment associations, or it may be owned by a private landlord. The annual rent may be as little as £8 per year up to about £125 and most leases are held for a very long time. The idea dates from the middle ages when most villages had some common land where local poor people could graze animals or raise small crops for their own subsistence needs. In the 1500s, this common land began to be enclosed by private landlords. Gradually, as more and more land was enclosed and society became more industrialized, people moved to cities and towns and the problems of the urban poor multiplied. In the 19th century, one attempt to address this problem was the provision of workers cottages with large enough back gardens to grow a private food supply. In fact, on the edges of some cities, you may still find tiny terraced cottages with remarkably huge back yards - a remnant from those times. By the mid-19th century, in the absence of any sort of welfare state and the growing problem of urban poverty and malnutrition, a series of laws were passed requiring local authorities to maintain land for allotments. The allotment movement once again became popular during World War II when a campaign known as Digging for Victory encouraged everyone to grow food to feed themselves and the nation. If you travel across Britain by rail, you will often see fields divided into allotments along the railway route. They look like little truck farms, often with ramshackle sheds, greenhouses or even small trailers. At the height of the allotment movement in late 19th and early 20th century, railroad companies provided their workers with allotments on the waste ground along railway cuttings and sidings. Many of these remain today and are still in use. 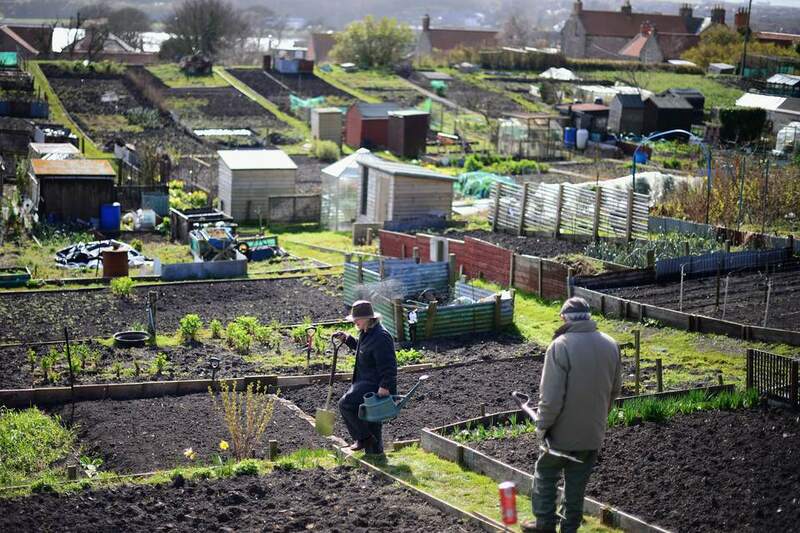 Other allotments, owned or protected by local authorities or the Church of England, can still be found near council estates and on the edges of small towns. Once again, as growing your own produce has become popular, city people and flat dwellers in towns join waiting lists to get their hands on these small plots of land - which are scarce as the proverbial hens teeth. Britain's National Allotment Society has more information about allotments, their history, and their role today. They have fascinating information about all sorts of allotment related matters including keeping hens and beehives on allotments, building structures and toilets and most importantly, about the growing pressure from local governments to sell off these mini farms. So instead of providing green lungs for cities and towns, they end up being paved over and developed. And allotments were not only a British phenomenon. In the USA, during World War II, they were known as victory gardens. You can still visit America's oldest and last remaining World War II allotments, the Fenway Victory Gardens, a seven acre plot in central Boston farmed by 500 individual gardeners.